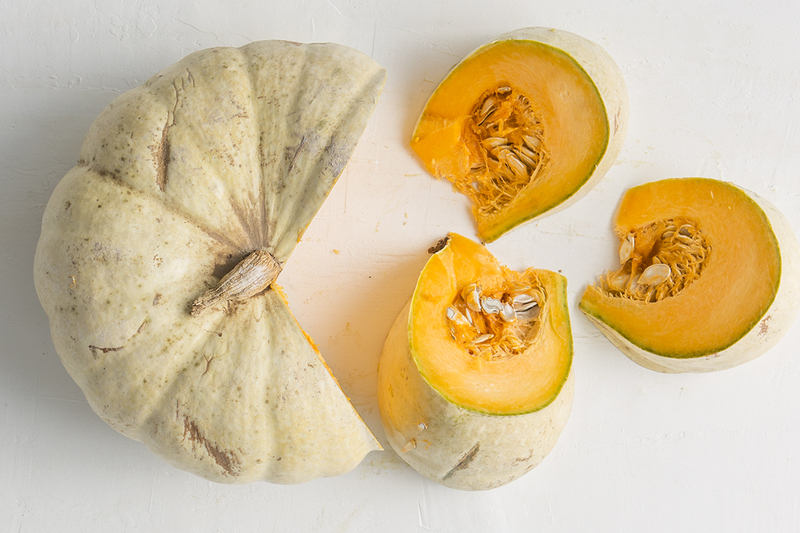 We sow the greatest variety of pumpkin seeds we can find, our favourites include Turks Turban, Flat White Boer, Dill’s Atlantic Giant, Big Moon, Queensland Blue and Halloween. Early autumn we start harvesting the pumpkins we planted in spring. Apart from roasting them whole, this is a favourite way for our chefs to serve up these autumn favourites. until smooth. Add a little butter if you like. Heat 600 ml vegetable stock in small saucepan and keep warm. Add 150 g butter in large heavy-based saucepan and heat until the butter has melted. Add 1 thinly sliced leek, 1 thinly sliced celery stalk, 5 g grated fresh ginger, 220 g Babylonstoren carnaroli rice (or arborio rice) and 1 cinnamon quill and cook for 1 minute. Add 200 ml Babylonstoren Chenin Blanc and cook through on medium heat until the liquid has evaporated. Add stock, a ladle at a time, allowing each to be absorbed before adding the next one. Continue for about 15 minutes until the rice is cooked but still firm. Discard cinnamon. Add pumpkin puree to rice and add a little lemon juice, stir through. Season to taste. Melt 100 g butter in a large saucepan and add 20 g sage leaves. Cook quickly until the butter becomes golden brown and remove from heat. Use 4 large warm plates and divide the roasted pumpkin slices between the four plates. Top with the risotto and drizzle with a spoonful of warm sage butter. 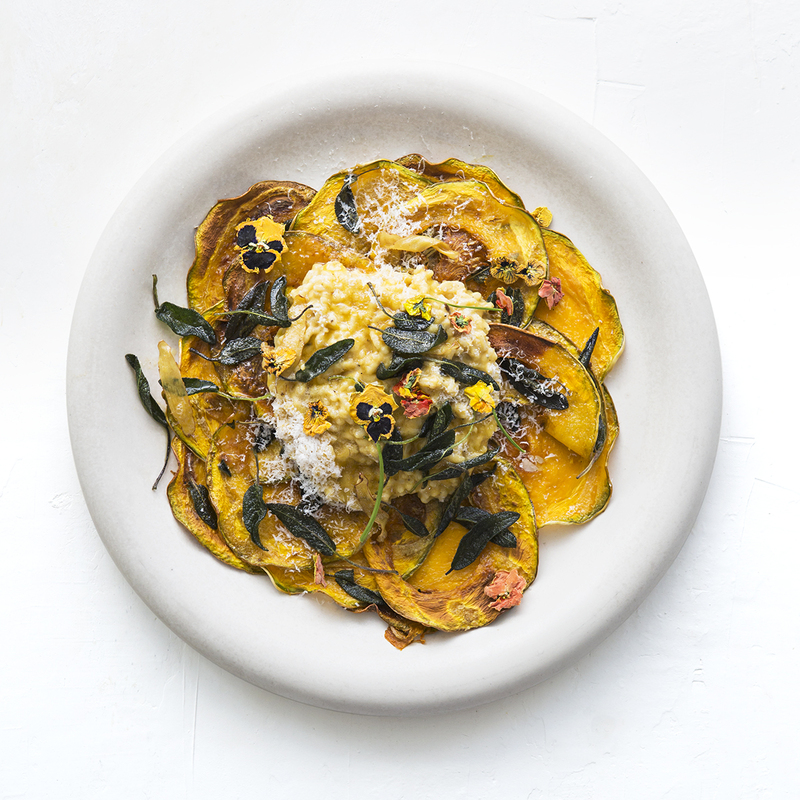 Sprinkle generously with grated parmesan and garnish with dried edible pansies. Place pansies between two sheets of baking paper on a baking tray and dry in an oven set to 100°C for 1–2 hours. Place something heavy like another baking tray on top to keep them flat. Sound delicious. Will be using this recipe for guest luncheon. I grew magnificent Flat White Boer pumpkins here in the U.K. much to the delight of my English husband. We will definitely be trying out your wonderful risotto recipe. Yummy!